Blue is cool and clean. A perfect contrast to the starkness of white. The unusual diamond shape is interesting. Using three tones of ashy blue creates a lovely patterned floor. Slate is one of the most popular material for bathroom floor ideas and designs. The natural stone and rich gold blush of this bathroom floor evokes rustic magnificence. Fabulous detail for bathroom floors! Slip-free bathroom floors can also be beautiful. The graceful olive branch pattern is mesmerising as it is stunning. Create elegance in your bathroom floor. The combination of stone and water jet tile mosaic offers texture, unique pattern and a tasteful hint of opulence. Modern, clean, no fuss. Hexagon is an interesting shape, and matte black is an interesting choice for bathroom floors. That didn’t stop this bathroom floor from projecting the simplicity and beauty of minimalism. Hardwood floors for the bathroom? Yes! Thankfully, there are tiles that look like hardwood. The natural grains and warm tones of wood will effortlessly compliment the whites of your bathroom tiles. Bring in texture and interesting pattern with basketweave tiles. You enjoy the look, without the fuss. Add the comforting ambience of spa to your bathroom with pebble tiles. The pebbles add traction to the floor, fascinating texture and delightful colour. Marble is one of the most luxurious bathroom floor ideas and designs. The magnificence of marble is in its natural beauty and lifetime durability. This floor creates an interesting pattern with the tile insets. How about some neat rows of deep brown tiles for your bathroom floors? This bathroom is as classic as the black and white combination, with a fun and luscious twist from the black tiles to chocolate. Simple, sensible, modern. With its natural grey complementing the white walls, the austere and unadorned concrete floors are chic, trendy and smart. Interesting detail with a hint of shine. The sand coloured tiles remind you of the beach. Penny tiles also provide good traction, preventing accidental slips. A fascinating shade of blue with an equally captivating design. The blue and white dandelion tile contrasts the white walls and creates an interesting pattern on your bathroom floor. Marble bathroom floors are the stylish, elegant and timeless. It is also the most durable bathroom floor material. No budget? You can still get the opulence of marble for less by substituting with marble-like tiles. An amazingly fun and modern version of the classic black and white. A delightful twist from the black and white checker tiles, this furry chevron pattern tiles make a marvellous bathroom floor! Add a touch of nature to your bathroom with white pebbles. Pebble tiles are versatile, complementing most bathroom styles including the rustic, minimalist, contemporary interiors. Tired of boring and usual patterns of bathroom tiles? Bring the same stone pavers you have in your driveway or garden paths! You get irregular shapes, different shades and remarkably unique bathroom floor. Go for the fun triangle tiles! Make more interesting by randomly injecting brightly coloured triangles to the neutrals. Complete the look of your blue and white Hamptons bathroom with blue stone floor. The random placements of the stones provide texture to the plain and solid colours of the bathroom. Delicate, fascinating, gorgeous. This bathroom floor features mother of pearl tiles in fun hexagon shape and delicate patterns. The elegant sheen of pearl exudes chic style and character. Modern matte black tiles arranged in the Herringbone pattern. Contrasting the white subway walls, the matte black of the floor is subdued, sensible and interesting. Add an exotic flair to your bathroom with these black and white Arabesque tiles. This modern and more interesting rendition of the classic black and white bathroom theme is minimalism with a classic vintage looks. Bare concrete floor and walls are trendy. But if you hate the austere look of concrete greys, use patterned tiles as accent to break up the monotony and to add an interesting feature to your bathroom. What is more fitting for your elegant bathroom than marble floors? Set in white, the beautiful veins of marble stand out. Best for blue of soft grey bathrooms. When you dare to go different and wild, go for the whimsical, unorthodox and fascinating. The fish scale shaped tiles create a captivating pattern and an adorably unique look. Stick to the classics with a creative upgrade. This black and white vintage bathroom floor gets a new pattern to match the contemporary bathroom. Calm, chic, modern. Adopt to the sparse and minimal look of today’s interiors. Go big on neutral colours, efficiency and minimalist décor. Dark grey slate tile floor will perfectly complement the understated and subdued look. Add a nice pop of bright and exciting colour to the neutral interiors of your bathroom. This modern bathroom added a block of red penny tiles against the white walls and floor. White interiors are among the most popular bathroom ideas and designs. Inject fun and colour to a traditional bathroom – retain the white walls and go wild with colour with the floors. A patchwork tile floor is fun, unique and widely creative. Play with shapes and colours of your tile floor floors. This unique and exciting bathroom features a floor with all the colours of the ocean. Remarkably delightful! You can turn inanimate tiles into fun and beautiful floors. These hexagon tiles are made more interesting by ingenious arrangements. 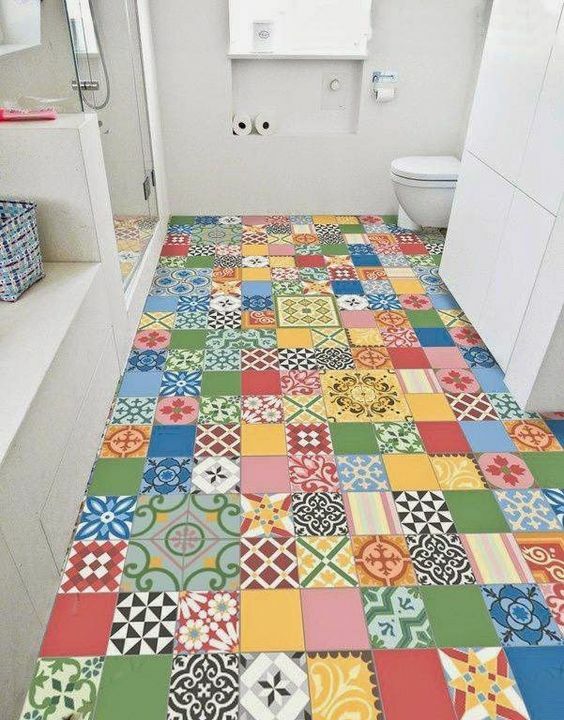 Get creative and design your unique bathroom floor. Fascinating colours, shimmery and striking. Glossy glass tiles are effortlessly gorgeous. Choose the tile colour, shape and size that would best match your bathroom design. This Scandinavian inspired bathroom is light, modern and reflects efficiency. Interesting detail is added to the Herringbone pattern of the white and wood tiles. The floor is the best venue to inject character and colour to your bathroom. The white interiors of this contemporary bathroom is relieved by the delightful colours of its honeycomb floor. Mixed pebble tiles provide additional traction and give amazing cool detail to your bathroom floor. The random shades of the stones will instantly remind you of the riverbed. Elegant, timeless, marvellous. Almost white Carrara marble, delicately cut into small hexagons, proves to be a classically elegant bathroom floor. And it will stay beautiful for a very long time. Definitely worth the investment. Retain the endearing rustic look of early bathroom styles while embracing the modern designs. You can ditch the less durable wood and replace them with wood designed concrete or ceramic tiles. Get the style for less the hassle. Add excitement to the austere modern Scandinavian style bathroom. A random mix of black and white patterned tiles will fit right in with the design, while giving it a good dose of fascinating details. The intricate and beautiful Mediterranean patterns are top favourite amongst bathroom floor ideas and designs. You can leave the rest of the bathroom simple with minimal décor – these black and white Mediterranean tiles is all you need for style. Blue and white patterned tiles are one of the timeless bathroom floor ideas and designs. Dressy, charming and fun. Goes well with most bathroom designs – white bathrooms, seascape and even the modern minimalist bathroom. Glass tiles are semi-transparent or opaque tiles made up of silica, sodium and potassium carbonate. Heating up the mixture hardens the slab and is then cut into desired shape. The glossy and durable glass tiles are popular bathroom floor material because of its beautiful tints and natural gloss. Create your own relaxing bathroom with this spa-inspired theme. Minimalist style with wooden slats for floors and walls. Mirrors, whites and discreet lighting complete the Zen design. The glossy translucence and interesting shades of glass tiles make interesting accents or bathroom floor borders. Get creative with patterns and designs! Terracotta tiles bring in bucolic warmth to the more severe modern designs of today. Blush brick tile walls and hexagon terracotta tile floors make one rustic and chic bathroom. Make plain concrete shine with gold insets. The random geometric shades add fun and fascinating details to the floor. You can paint a few random shapes for a pop of colour. Do you have any fascinating and fabulous bathroom floor ideas and designs that we haven't covered? Why not discuss it on our RenoForum!